In the peaceful countryside of Coreggia, a small village 3 km away from Alberobello, a wonderful group of trulli has been recently restored to life. Now it is ready to welcome guests and provide the setting for an unforgettable holiday. There are two double bedrooms and a twin room, two bathrooms, one with antique style bath with claw feet and one with shower enclosure. The open plan living space has a kitchen and dining area, a fireplace and an area with comfortable seating and tv/dvd player. 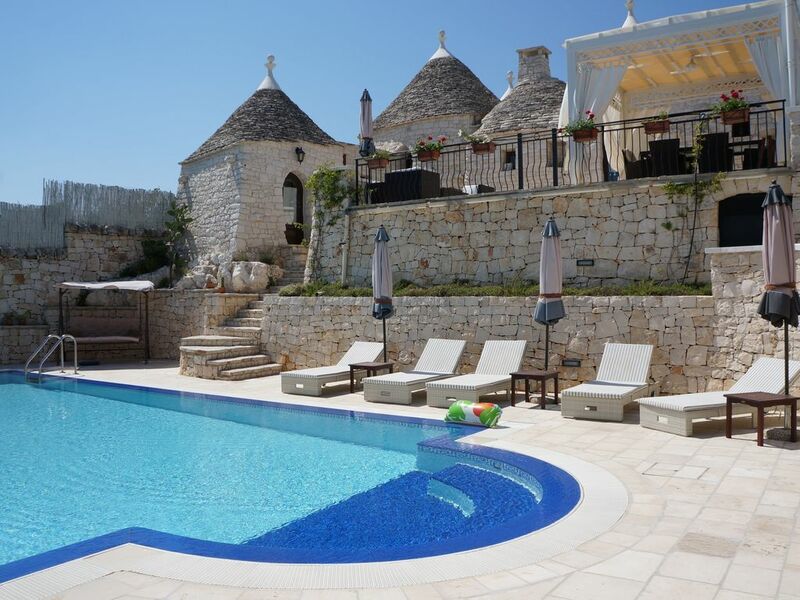 Outside there is a panoramic roof terrace from which to admire the trulli of Alberobello and, at ground level an outside dining area with barbecue. The large pool has a hydromassage feature and is equipped with loungers, umbrellas and an outdoors shower. Surrounding the property are olive, pomegranate and cherry trees and flower beds to add colour to the already spectacular setting. The complete peace and quiet of the surrounding countryside is enhanced by the murmering of a little pond. We found the property, the grounds and location to be stunning. The location gives great privacy, however it is just a ten minute stroll into the village with a bakery, two restaurants and a shop. The property is finished to a high standard and is simply charming. The pool and grounds are beautiful with good quality furnishings. Luci could not have been more helpful. Thank you for a wonderful holiday. Stunning property with amazing pool. One of the best holiday properties we have ever stayed in. Full of character, comfortably furnished and well equipped. The information and support provided by Lusi was also some of the best we have experienced. Most of the information you need about the property itself and the surrounding area is provided in the pack provided as well as the comprehensive welcome and introduction given by Lusi. Any other queries are promptly and patiently dealt with by Lusi . Would highly recommend for a wonderful holiday in a beautiful region of Italy. PERFECT in every way possible !! We had a wounderful time. The house is great, every detail has been taken care of. gorgeous. Lusi and Vito are so nice, always making your stay very pleasant. We did touring in the area, and we were always delighted to get back. The place is spotlesly clean. In all we had the most pleasant stay, we feel sorry we had to leave! We sure RECOMMEND this beautiful Trulli 100% ! ! ! ! You definitely wont regret it! Grazieee!!! Thank you to you all! You are so kind! I really hope to see you again and...thank you for the picture. Finally we had a week for us in the countryside! A most charming property. Alberobello is delightful, unique and picturesque. A relaxing and enjoyable time was had by us all at the trullo - and figs and almonds from the trees tasted wonderful. Thanks to Lusi fro keeping a watch over things. Wir haben in diesem schönen, sehr stilvoll eingerichteten , sehr idyllisch gelegenen Trullo 10 herrliche Tage im Mai verbracht . Für 6 Erwachsene hat es die perfekt Größe. Der Service von Lusi war super ,wir bekamen direkt von Ihr viele wertvolle Tips für Ausflüge, Restaurants, etc. Bei Ankunft erwartete uns ein Essenpaket mit einigen Dingen für Frühstück/Mittagessen. Das Haus ist in einem sehr guten Zustand und perfekt ausgestattet. Der Pool ist sehr sauber , wunderschön und sehr groß ! Nachbarn bemerkt man nicht , denn das Grundstück riesig mit Oliven- und Kirschbäumen ( sehr lecker) und nicht einsehbar. Die Terrasse war unser absolutes Highlight, denn unter dem Pavillon sitzt man geschützt mit herrlichem Blick . The trullo is in Coreggia, a little hamlet of Alberobello, surrounded by country sceneries, ideal for relaxing holidays. Alberobello, wounderful and suggestive town in the South of Italy, is very famous for his particular houses called 'Trulli'. These chatacteristic houses, Unesco heritage, are about 3000 (in the historical centre), but they are spread everywhere around. Unique in the world and still lived, they are completely built in stone. This make them fresh in the summer and warm in the winter. The town offer a large choise of restaurant, clubs and bars which serve a large variety of tipical dishes of the mediterranean cooking, served with excellent wines. Ski: You can enjoy touristic flights, over Puglia, Basilicata, Greece and Croatia. Various Itinerary are available, but they can be modified according with the pilot. We suggest to make a request in advance to assure the availability of the plain. This is a real different way to see over the usual point of view. A unique and special experience. To make and enquiry about prices and times, please contact us. Contattateci per un preventivo dettagliato! Alle famiglie applichiamo uno sconto del 5%. Ricordiamo che i prezzi sono per l'intera struttura.